The other day I had three distinct professional roles to play. First, I had a meeting with a lovely young woman who is looking for a wedding officiant for her upcoming big day. Here, I saw myself as the High Priestess…composed, serene…well, official and ceremonial! 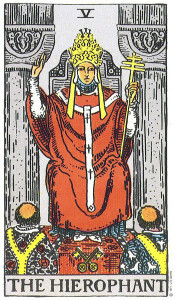 You may argue that wedding officiating may fall into the bailiwick of the Hierophant, but that’s just not how I roll. Second, I had a meeting with a wonderful woman who is on the Board of a not-for-profit historical foundation that I do some very casual event planning and admin support for. 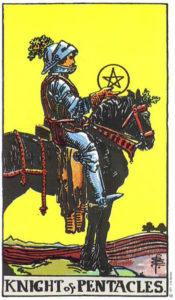 In this role, I saw myself as the Knight of Pentacles, reliable, fiscally responsible, ready to do the work that needs to be done. Lastly, I taught the final class in my Tarot Beginner series to an amazing, brave and intuitive group of students. Here, was I the Hierophant, the archetypal teacher? 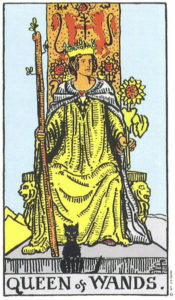 Perhaps I was, but with a lot of the fiery Queen of Wands thrown in. When I’m teaching, I try to keep things interesting and lively, rather than falling into the dulcet lecturing tones of the Hierophant. In between there I suppose I really got to be myself, without any robes or masks or ceremony. When I was having a cup of tea, or walking across the city streets to my next appointment, I just WAS. Sometimes I get tired. I am building my Tarot business, and that involves a lot of hustle. The Lori Travelling Tarot Roadshow. Have cards, will travel. Sometimes I get impatient. I want everything now. 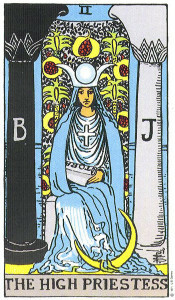 I want to create something wonderful that adds to the deep pool of Tarot knowledge and beauty. I sometimes cry out of sheer frustration and fatigue. But, every day I am GRATEFUL. Running a business on my own has its challenges, but the fact that I am doing Tarot and making a living at it is a shining miraculous thing. Dream come true. Even when I’m at my most depleted, I am still full of determination and gratitude. And I can’t imagine going back to my previous life. Take care of your body. Eat well, drink water, exercise, sleep, repeat. Find healthy ways to release stress. Netflix and wine are great, but too much of either may leave you even more depleted (especially if you’re like me and a lot of what you watch involves vampires, zombies and dragons). Meditate, walk, spend time with loved ones, bake a cake, paint a masterpiece…whatever works for you. Recognize when its time to surrender and put work aside for the moment. There are some days when it may be better to just relax, or to do something that may not move your business forward but is still beneficial (I put housework in this category). If your brain or heart is fried, you’re probably not going to produce your best work. Of course take care of anything urgent, but if possible, let the rest go for a day, an hour, whatever you can. Express gratitude. I know it sounds corny, but it works. Thank the universe for all the good things in your life, and all the good things you know are heading your way. And really mean it. Give your all. When you’re working, give it your 100%. When you’re not, be present in the moment, 100%. Constant multitasking or splitting your mental and emotional focus can be exhausting. Get a Tarot reading. Just had to throw that in there. In all honesty, this is a work in progress for me. I KNOW these things to be true and in my best interest, but I am not always so good at doing them. Sometimes I go haywire, and I have to bring myself back to center. But, I feel myself getting stronger, and I know I’ll just keep on growing until I reach that place of consistent balance. Living a life that expresses who you really are and what you are passionate about can be down to your bones challenging. Until you find your way it can be a roller coaster of highs and lows, triumph and despair, self doubt and feeling your power. If you are kind to yourself, and grateful that you have the courage and opportunity to take that ride, you will find a way to thrive.